Tungsten halogen adds an additional component, halogen, to the standard incandescent light. So how does halogen lighting work? Well, halogen is mixed with the gases in the bulb, and interacts with the evaporated tungsten so that it is redeposited on the filament. Halogen lighting lasts longer than incandescent lighting, and it does not become blackened when run at full voltage. 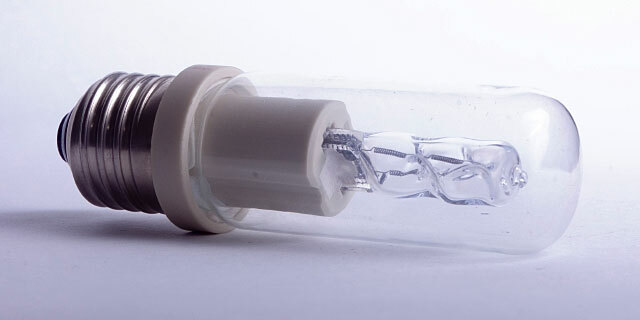 Because the filament burns at a higher temperature and the process needs more gas pressure in order to work correctly, halogen bulbs are smaller and made of quartz so they can handle the increased heat. The light that a halogen lamp casts is significantly whiter than the light cast by a standard incandescent bulb. This is because the filament burns at a much higher temperature. The color temperature of halogen lighting is more than 3,000 degrees Kelvin, and it has a balanced wavelength pattern. All this means is that the resulting halogen lighting is bright and sparkling white. Colors seem more intense, clearer, and are more sharply defined when illuminated with halogen lighting. Like incandescent lighting, halogen lighting can be run right from the household current. Halogen is the closest type of light to daylight, and works well in areas, such as workspaces, that require bright, clear light. Halogen lighting can also be used for dramatic effect. In uplights or downlights, it creates a background effect that highlights architectural detail, while in spotlights it can dramatically enhance a colorful piece of artwork. Like incandescent light, halogen light can be dimmed and responds instantly to a switch. 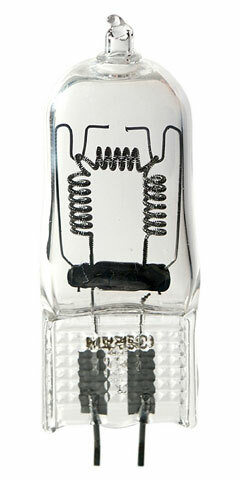 Bulbs are available in many different styles, including tubes, and in a range of wattages to more than 700 watts. The lifespan of a halogen bulb is longer than that of an incandescent bulb, up to approximately 3,000 hours. For information concerning the invention and development of halogen lamps, visit the Smithsonian Institution's Elmer Fridrich and Emmett Wiley's Tungsten Halogen Lamp and Frederick Mosby's Tungsten Halogen A-Lamp web pages.